 "Cyclone 30," Ion Beam Applications, www.iba-cyclotron-solutions.com. Magnus Normark, Anders Lindblad, Anders Norqvist, Bjorn Sandstrom, and Louise Waldenstrom, "Syria and WMD: Incentives and Capabilities," FOI Swedish Defence Research Agency, June 2004, p. 55, www2.foi.se. Wyn Q. Bowen, and Joanna Kidd, "The Nuclear Capabilities and Ambitions of Iran's Neighbors," Getting Ready for a Nuclear-Ready Iran, eds. Henry Sokolski, and Patrick Clawson (Carlisle: The Strategic Studies Institute, 2005), p. 73. "Syrian Arab Republic," Directory of Cyclotrons used for Radionuclide Production in Member States, p. 371, www-naweb.iaea.org; Nuclear Programmes in the Middle East: In the shadow of Iran, ed. Mark Fitzpatrick (London: The International Institute for Strategic Studies, 2008), p. 78. "SYR/4/007: Cyclotron Facility for Medical Radioisotopes," IAEA-TC Project Datasheet, 1997, www-tc.iaea.org. Wyn Q. Bowen, and Joanna Kidd, "The Nuclear Capabilities and Ambitions of Iran's Neighbors," Getting Ready for a Nuclear-Ready Iran, eds. Henry Sokolski, and Patrick Clawson (Carlisle: The Strategic Studies Institute, 2005) p. 73, www.strategicstudiesinstitute.army.mil; "Syrian Arab Republic," Directory of Cyclotrons used for Radionuclide Production in Member States, p. 371, www-naweb.iaea.org. Magnus Normark, Anders Lindblad, Anders Norqvist, Bjorn Sandstrom, and Louise Waldenstrom "Syria and WMD: Incentives and Capabilities," FOI Swedish Defence Research Agency, June 2004, p. 55, www2.foi.se, "Syrian Arab Republic," Directory of Cyclotrons used for Radionuclide Production in Member States, p. 371, www-naweb.iaea.org. IAEA, "Syrian Arab Republic," Directory of Cyclotrons used for Radionuclide Production in Member States, p. 371, www-naweb.iaea.org. R. Scott Kemp, "Nuclear proliferation with particle accelerators," Science and Global Security 13, 2005, p.201. 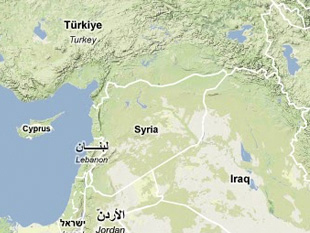 IAEA, "Country: Syrian Arab Republic," IAEA-TC Projects by Country, www.iaea.org.